The miracle cure, the panacea so much sought after in the history of mankind and yet so unattainable and utopic. I always wonder who was the first one to put a particular plant on a kettle to make an infusion or prepared a cataplasm to apply on wounds or simply decided to chew up some leaves after watching animals react (well, it happened with coffee berries anyway!) How many anonymous individuals probably dropped dead after doing that and exclaimed in the last moments of agony - wrong leaf, forget about this one! 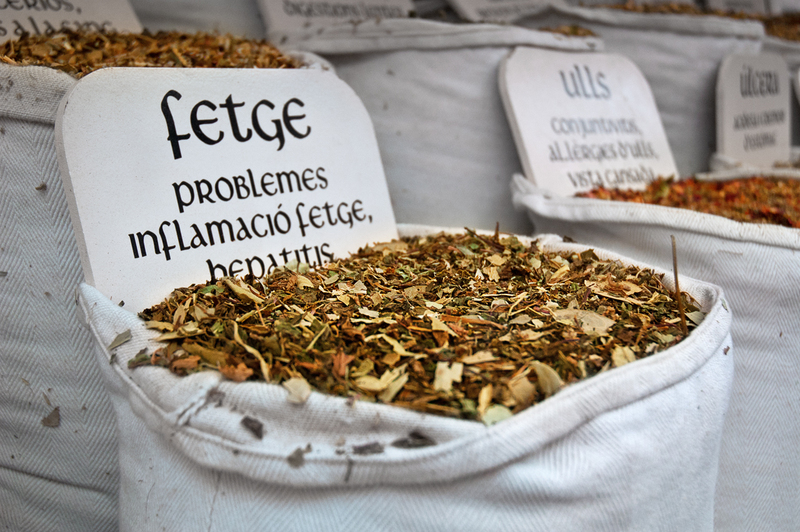 Here are some samples of medicinal herbs at a local medieval fair in Vic. I don't know the name but it is indicated in the treatment of a swollen liver or hepatitis (fetge means liver in Catalan). A good example of old remedies for liver illnesses would be Anemone hepatica or hepatica nobilis. Not only was that a superb photograph but your commentary made me laugh too. I love your comments as much as your photographs and your use of language, despite it not being in your mother tongue always surprises me. I don't know about medicinal herbs, but reading your blog is a tonic for me each day and always cheers me up. I can honestly say that you write like a native English speaker. Your grammar and puncutation is excellent. I'm ashamed to say that I am typical englishman who can't speak another language even though I would love to. One situation which put me to shame was actually on my first visit to Barcelona. We decided to walk from La Rambla to the Sagrada Familia (we had no idea how far away it was!!!) and after about half an hour we asked a young man if he could direct us. In excellent English, he managed to give us directions. He stumbled on only a couple of words and he apologised and asked us to forgive his poor English. We were humbled and felt very ashamed because here we were, in this mans home city, not being able to speak a word of his language and he was apologising to US for not knowing some English words. From that poing in we were determined to at least attempt to speak some Spanish or Catalan. You get the balance on your blog just right Carlos. It is informative, funny and educational. That is why it is my favourite web site. I hope you never stop blogging Carlos. Well done and a huge thank you. Thanks so much. You are going to make blush. I see your point when you talk about somebody apologizing in his own country when it should be the other way around. English is more international though. Comments like yours are appreciated. I learned the language because I love it and being flattered by a native speaker is more than a philologist could ever ask.